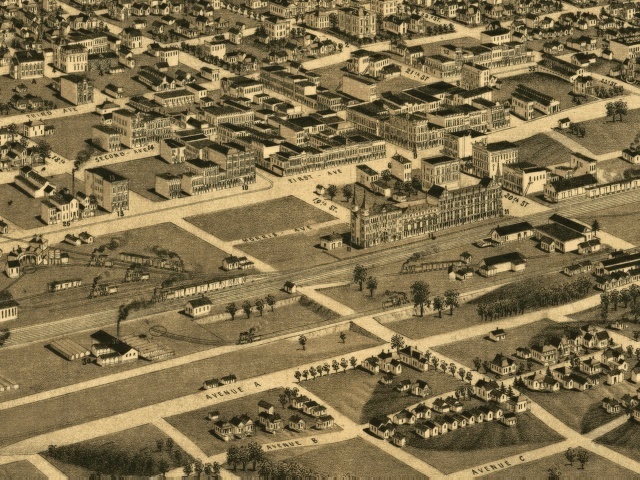 In this view we see the area around 20th Street, and a large building immediately north of the railroad, west of 20th. According to the legend on the original panoramic map, this item, number 11, is "Proposed Hotel and Union Depot." This location did become the home of a Union Depot, and served in that role until 1907 when the Terminal Station was built at the east side of the business district. Until that time, this area was close to the heart of the City. It was the focus of transportation in the area, and new office buildings were generally located close by in the coming years. Also in this area, on the south side of the tracks is a large brick works, at the lower left corner of the image. There is a large pit next to the brick works--is this where the clay came from?